Many of you sharp readers are aware of my admiration for Michael O’Brien. It is no secret that I consider him one of the most talented and brilliant fiction authors of the last 100 years. I’ve read most of his work, and I can’t praise it enough. Seriously, you need to read him. I recently highlighted his book Strangers and Sojourners, but if you’ve never read him before, you might also consider the widely popular Father Elijah. You won’t regret it. This book is a collection of talks, short essays, and selected readings all pertaining to the End Times – the Great Apostasy, the confusion in the Church, the Antichrist, Jesus’ warnings, etc. And for O’Brien, this thing is short. It’s only 161 pages long. The End of the World will happen. Jesus says so in the Bible. No, it’s not for us to know when, but it’ll happen. O’Brien’s book explores that. Many in the Church would have you ignore the Sign of the Times. Of course (do I need to say this?) O’Brien in not a sensationalist, but rather a realist. Just what is going on, on a Supernatural level? He has a few provoking thoughts. This chapter is so awesome. O’Brien quotes G. K. Chesterton and Blessed Cardinal John Henry Newman and Christopher Dawson and Joseph Pieper and St. Paul and Jesus. You need to read it. 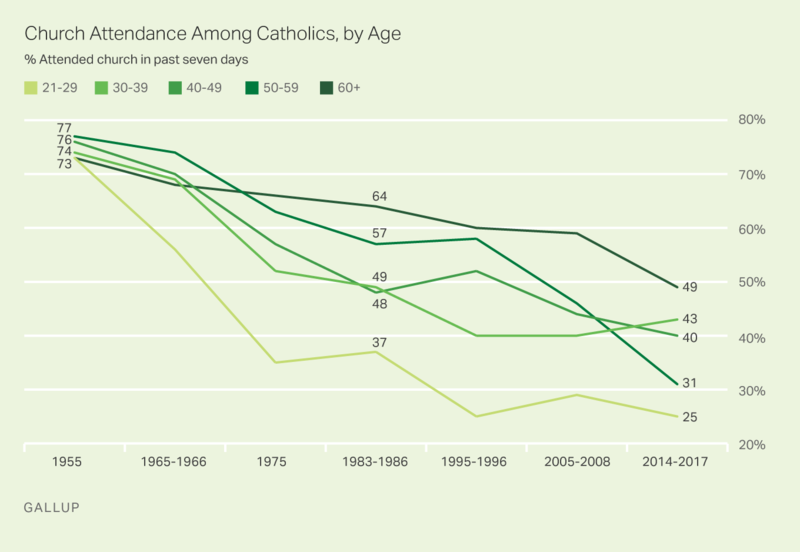 Here’s the latest Gallup Poll on Mass attendance for Catholics. Yikes. Some 70% of Catholics attended Mass weekly in 1955. Today? It’s closer to 39%. What the hell happened? As a reflection, just think of what has happened in the Church since 1955… We’ve had the complete stripping away of our once beautiful churches. Latin has been thrown out. High altars have been ripped out. Gregorian chant is almost nowhere to be found. Religious Sisters shunned their habits. Ember Days are gone. And Catholics know more about their favorite sporting teams than their own faith. You can’t tell me something isn’t going on. Michael O’Brien thinks so, and I’m inclined to agree with him. Wake-up, people! And go read his book.